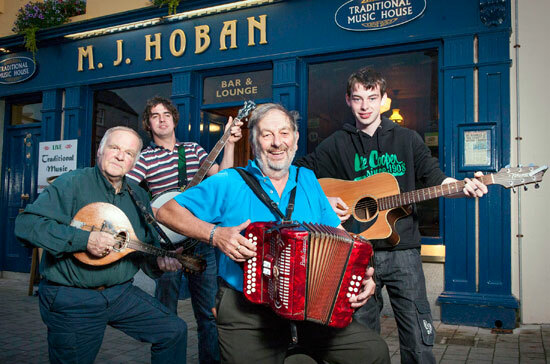 MAKING MUSIC?Tom Mulloy (centre) and Pat Mulloy (extreme left) are pictured with Neil Mulloy and Tom McGinty outside Hoban’s Bar in Westport. FRIDAY evening. Not yet tea-time and already there’s a crowd gathered in Hoban’s Bar on Westport’s Octagon. Inside Tom and Pat Mulloy of Mayo’s most famous balladeers the Mulloy Brothers, are singing a rousing ballad from their wide repertoire as the revellers chorus them in sing-along hand-clapping accompaniment. With the Mulloy Brothers there are no gimmicks. To entertain has ever been their mission statement. It’s all about audience participation and their stage show is based on the cordial interaction they generate. It’s the modus operandi they set out with and remained ever true to. It’s a simple presentation technique Tom acquired many moons ago watching Neil Kilbane, violin player and MC with Achill’s Colman Ceilí Band. Annie and Philomena O’Toole tend the bar in Hoban’s. Institutions giving courses in good hospitality etiquette couldn’t teach what the Inishturk sisters possess. You either have it or you don’t, and they do. They’ve a welcoming word and they find time for a friendly chat with customers between the fillings and servings of ale. The Mulloy’s and their entourage are resident band here on Wednesdays and Fridays for most of the year round. And almost on cue, a practical example of Annie’s appraisal. There’s a visiting party of Germans among the clientele and Tom’s already spotted them. “What part of Germany are ye from lads,” he enquiries. “Berlin,” one among them replies. Then a rendering of “The Green Fields of France” for a French group. Another request arrives and Pat’s feisty warbling of “Paddy Lie Back” is delivered with the ease of a man filling his pipe with tobacco. Their musical career began when ‘as gasúrs’ they sang during intervals at concerts and plays in halls around their native Mulranny. The winds of change were blowing too. In the mid-60’s the singing lounge bar became rural Ireland’s newest phenomenon. Tonragee native Tommy Corrigan, and his wife Tess, returned from Dublin and opened Corrigan’s Singing Lounge (now Campbell’s) in Mulranny. The Mulloy Brothers became the resident band. Word quickly chorused of the four balladeers and the brilliant show they put on. Tom was working in Dublin where he bought a second-hand Ford Prefect for £70, fitted it with a roof rack, and the Mulloy Brothers were on their way. They’ve performed in most every village and town throughout Mayo. From the Barony of Erris and McGuire’s Pub in Pullathomas (where Delia McGuire’s kitchen doubled as their stage) to the south of the county and Brendan and Mary O’Mahoney’s Riverside Inn in Cross where they never left without a generous helping of Mary’s sandwiches. Castlebar too, and The Humbert Inn, where renowned chanteuse Mary Black was resident singer. She did backing vocals on their first EP recorded in Dublin. “Can you remember the name of it?” Tom wonders aloud to Pat. “Cripes I can’t, did we call it anything at all?” he replies. “We must have because we got rid of every copy,” Tom responds. We’ll save you the googling. ‘Jennifer Gentle’ was the title. They’ve toured England and America, and released another bestselling album, ‘The Coastline of Mayo’. They played with the Dubliners and cite the Clancy Brothers among their musical influences. They performed for John Lennon of The Beatles. Tom tells of the subsequent fame that brought. “I went into a pub one night for a pint on my way to a dance in the Wavecrest and Neil Kilbane and the Colman Ceilí Band were playing inside. ‘Here comes Tom Mulloy, the man who played for the Beatles,’ Kilbane announced to the crowd. Jaysus, but I got a great kick out of that. THEIR first wedding engagement was in Ted Lavelle’s of Cashel as Tom recalls. “We had no transport so they collected us. Martin played the bagpipes. They became a great novelty at weddings. When the bride and groom were leaving the reception the guests formed a human archway and Martin piped them out under it. They’d be tin cans and jam jars tied to the car and they’d give them a right rocking entirely before they’d take off. You’d have Martin playing outside, us playing away inside. “I was in Johnny McHale’s pub across from the Welcome Inn one day and he said, ‘Ye were playing at a wedding over there last Saturday’. ‘How did ya know that?’ I asked him. ‘I heard the pipes and I knew it was ye,’” he said. Martin playing the bagpipes became the signature tune to all civic receptions, official and impromptu. Whenever a dignitary visited Mulranny he piped them through the village. The drone of his bagpipes a musical accolade for politicians of every persuasion too, returning elected to Erris or Achill. On one visit the late Albert Reynolds borrowed a drum and tapped a beat to Martin’s music. As well as entertaining the customers they also provided them with fresh Atlantic salmon betimes. Tom and Martin did a bit of fishing and they often took a crate of their catch to a gig. It gives rise to another of Tom’s many anecdotes. “We were above in the Squealing Pig in Ballyglass and a woman asked me how she’d prepare the fish. ‘Give it to me mam’, I said, ‘And I‘ll fillet it for you’. “I went into the kitchen and got a knife and before long there was a gang gathered around me and me in the middle of them cleaning fish. Next thing a guard walked in and asked us what we were at. Tom and Pat are the only surviving members of the quartet now. In 2007 Michael passed away following a long illness and in 2010 Martin died tragically in a boating accident in Mulranny pier. But the music lives on with the next generation in the van now. Martin’s wife, Maureen, gifted Martin’s treasured banjo to Tom’s grandson Neil and he’s serving his musical apprenticeship with the musical masters. Another member is Tom McGinty from Tongaree, a young man imbued with a natural stage presence. Rory McGinty joins them on occasions as does Tommy Gavin from Westport. In London, Tom’s son, Enda, has his own band ‘Bible Code Sunday’. But the Mulloy Brothers and their ballads have outlasted the challenges of fluctuating phases. Their name is as much part of Mayo lore as Michael Davitt, Raftery, the poet, Grace O’Malley, Ciaran McDonald, Mary Robinson, Michael Commins or even St Patrick himself. For over a half century their dulcet tones have entertained audiences across Mayo and the oceans beyond. Mulranny’s wandering minstrels still regale every gathering gathered around them with a friendly word and a lively song. The Mulloy Brothers were born to entertain.